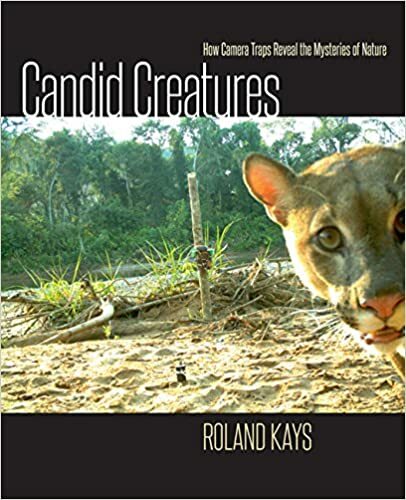 In Candid Creatures, the first major book to reveal the secret lives of animals through motion-sensitive game cameras, biologist Roland Kays has assembled over 600 remarkable photographs. Drawing from archives of millions of color and night-vision photographs collected by hundreds of researchers, Kays has selected images that show the unique perspectives of wildlife from throughout the world. Using these photos, he tells the stories of scientific discoveries that camera traps have enabled, such as living proof of species thought to have been extinct and details of predator-prey interactions. Each image captures a moment frozen in the cameraвЂ™s flash as animals move through their wild habitats. Kays also discusses how scientists use camera traps to address conservation issues, creating solutions that allow humans and wild animals to coexist. More than just a collection of amazing animal pictures, the bookвЂ™s text, maps, and illustrations work together to describe the latest findings in the fast-moving field of wildlife research. Candid Creatures is a testament to how the explosion of game cameras around the world has revolutionized the study of animal ecology. The powerful combination of pictures and stories of discovery will fascinate anyone interested in science, nature, wildlife biology, or photography. in open forests with abundant Brazil nut trees. It was unclear whether they were eating the fruit themselves or the smaller seed eaters attracted to the trees. Short-eared dogs are relatively omnivorous, eating fruit in addition to small prey. Some studies report a large amount of fish in their diet, which would be unusual for a canid. There are also numerous visual reports of them walking along riverbanks and even swimming in the water, giving additional credit to the fish-loving hypothesis. Salampessy. 2007. The conservation of tigers and other wildlife in oil palm plantations. ZSL Conservation Report 7:1вЂ“66. Maehr, D. S., E. D. Land, D. B. Shindle, O. L. Bass, and T. S. Hoctor. 2002. Florida panther dispersal and conservation. Biological Conservation 106:187вЂ“197. Magle, S. B., L. S. Simoni, E. W. Lehrer, and J. S. Brown. 2014. Urban predator-prey association: Coyote and deer distributions in the Chicago metropolitan area. Urban Ecosystems 17:875вЂ“891. Magoun, A., N. Dawson, R.